I have not been going to the gym for a long time already. Been a member of Fitness First for some years before and I miss working out - seriously! I feel I need to pump up those muscles again and gain weight. There will be a good reason for me to hit the gym once again. On March 14-20, 2011, Fitness First, the world’s leading health and fitness club, opens all its doors nationwide to everyone for FREE, in celebration of the 2011 International Fitness Week. International Fitness Week is a global campaign that aims to promote healthy living and fitness through exercise and enjoyable group activities. Now in its third year in the Philippines, Fitness First together with former Spice Girl and Global International Fitness Week Ambassador, Mel B, is encouraging the public to becoming more active and fit while providing solutions to different health concerns such as weight loss and high cholesterol. “Our business at Fitness First is all about changing lives. We offer our services to help people get healthy no matter what their motivations are. Fitness First is here to support you. This March, we are strengthening our commitment to wellness through International Fitness Week. We’d like to encourage everyone to start moving and prioritize their health.” Says Mark Ellis, Country Manager of Fitness First Philippines. For an entire week, Fitness First will treat everyone to a selection of services. Each day will have a different focus including “Strength Day” where activities will center on how one can build their strength, “Cycle Day” in which spin classes will be offered to both rookie and experts, “Shape Day” where classes devoted to sculpting and toning one’s body will be offered with the help of different innovative techniques and free consultation with Fitness First’s resident nutritionist and “Health Check Day” which will provide participants with a 5 point health check. In addition to this, there will also be “Functional Training Day” which can help people be more productive and energized to tackle their daily activities, and “Group Exercise Day” where beginner cardio classes will be offered. Finally, to culminate the week-long celebration, “Fun Day” will give participants a preview on Fitness First’s newest weight loss program, Lose It. 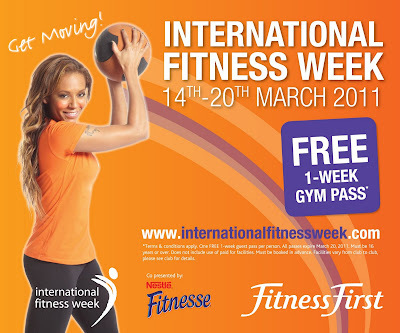 Fitness First would like to invite members and non-members alike to this opportunity as it will only run for 7 days during the International Fitness Week. Use the gym, feel free to try the equipment, consult with a nutritionist and join the many exciting classes this coming March 14-20 2011 at any Fitness First club near you! How does that sound? To learn more about International Fitness Week and Fitness First, please visit www.internationalfitnessweek.com or www.fitnessfirst.com.ph.